This instrument was commissioned from Christoph Schissler by Ioannes Rosenberg in his own memory. 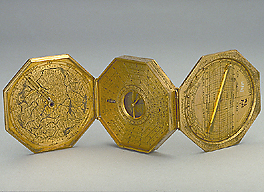 It is indeed a very fine exemplar, with a map of the northern hemisphere and one of central Europe on the upper leaf, and a dial for four latitudes on the central box. The lower leaf is engraved with an aspectarium, a nocturnal and various devices for finding the times of sunrise and sunset and converting different systems of hours.